Deep inside the heavily wooded forest of Corbett National Park rests a Machaan that gives shelter to hundreds of photographers, naturalists and tourists visiting Corbett every year. 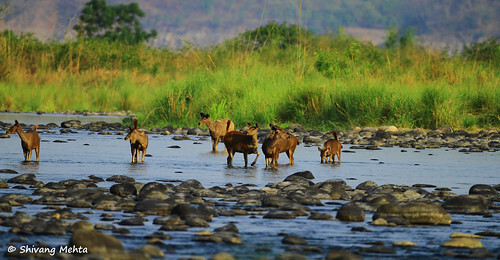 Approximately 30 feet in height, this old machaan gives a panoramic view of the picturesque Dhikala grasslands and the Ramganga river that supports a multitude of life forms in Corbett National Park. “The forest is always buzzing with activity,” the statement holds true once you spend a quite afternoon on this structure in the heart of wilderness. It was the month of June when Kahini and I set off from the Gairal forest rest house in Corbett early in the morning in search of the dominant male tiger in the Khinnauli belt. We had been tracking the striped beauty for the last 2 days and our chances were becoming brighter as we saw fresh tracks early that morning along with frantic alarm calls of spotted deer. However luck was not in our favor again as after waiting for over 2 hours near the river side (where we were expecting the arrival of the tiger) the beast still eluded me and my camera. As we continued our journey by heading towards the Dhikala grasslands the passing vehicles informed us about tiger movements on the Sambhar Road and we rushed towards our beloved Sambhar Road watchtower which gives the perfect view of the area in which the tiger was prowling. We boarded the machchan at 8:30 am and strained our ears to listen to the faintest of sounds of the alarm calls that would announce the arrival of the king. In the next couple of hours the forest went silent and the cool breeze put me to sleep. A watchtower can be a wonderful place for catching some sleep as the calmness and tranquility of the forest is very relaxing indeed. 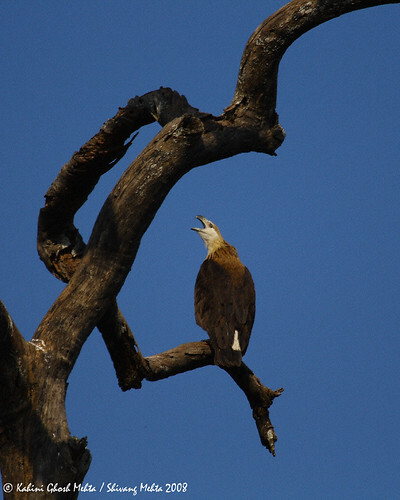 The silence was broken by a black jungle crow that woke us up with his hoarse calls and to our surprise we sighted a beautiful collared falconet right in front of us. The atmosphere was filled with excitement yet again as a pair of pallas fishing eagle took off from inside the forest and stormed past the watchtower making a screeching sound giving us a great shot of the flight of the eagle. 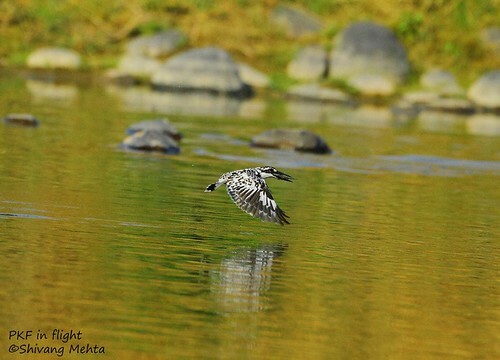 Following this Kahini spotted a pair of pied kingfishers hovering over the river in search of their lunch. 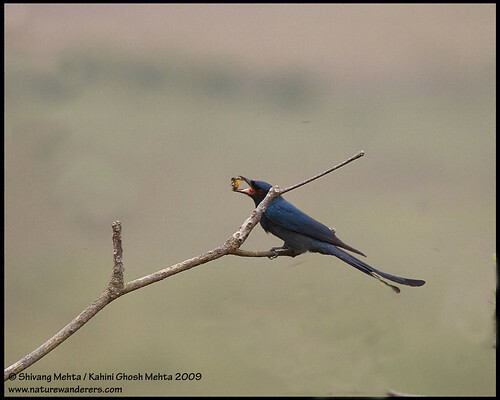 Their close cousins – the white throated kingfishers – followed them and looked stunning with their colorful wings wide open. Amidst the birding action, a small herd of spotted deer inched closure to the river and boosted our chances of tracking the tiger. 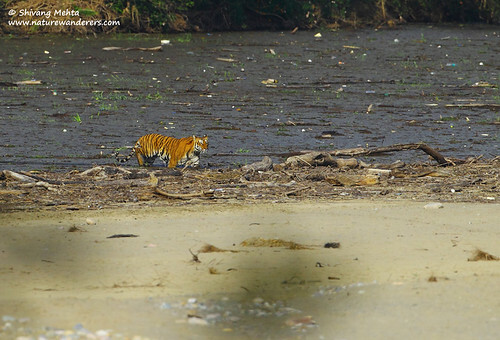 The weather was perfect for a tiger to approach a water body as it was getting hotter and humid as the clock ticked. And then the spotted deers in front of us made a low alarm call. We could see that all the deers were pointing in one direction and stamping their feet in the water in nervousness. The excitement was at its peak as this is what tiger tracking is all about. This is why the tiger sends shivers down the spines of the jungle folk when it moves fearlessly in forests of India. It was only a matter of time now and we were anxiously waiting as everything was falling into place… 10 minutes went by and by now the alarm calls became louder. Our eyes were glued to a patch of lantana from where we were expecting the tiger to come. 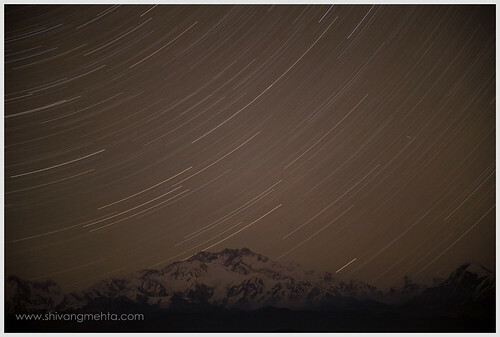 My sleep had vanished and I was ready to shoot with my fingers half pressed on my camera shutter. It was 4 pm and with a slight disturbance in the lantana, out walked the tiger. Those magical stripes were shining brightly in the sun and the tiger walked past the deer herd majestically to choose his preferred spot in the river. It was a big male and he rested royally in the middle of the sparkling Ramganga for the next 20 minutes! I had heard a lot about Singlila… Rare Himalayan birds, the exotic red panda, Himalayan black bears and the elusive clouded leopard. Despite of the high potential of wildlife on offer I entered Singlila with zero expectations. My aim was to enjoy the beauty of this remote wilderness of India and ofcourse the joy of trekking through virgin forests – something which I have always enjoyed. Within the first few hours of setting my foot inside Singlila National Park, a few aspects of the forest caught my eye. From the soft morning light that turned this forest to gold to the unpredictable mist which can settle in at any time of the day dramatically changing the mood of the forest, Singlila had a lot of hidden shades which I was looking forward to discover. My first freezing morning had a lot in store as I started my trek. Yes ofcourse the birds were there but as a photographer I prefer chasing the light rather than the species. Each and every bend I walked through had some natural jewels in the form of rejuvenating flowers, leaves and frozen frost droplets garlanding each and every part of this exotic forest.